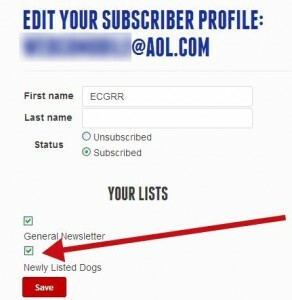 After signing up for our Newsletter, you have the option of receiving our Newly Listed Dogs alert. 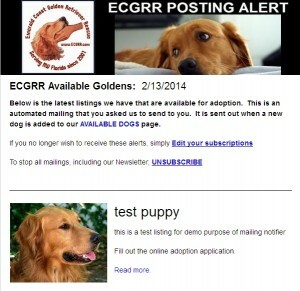 This email alert notice is sent out to subscribers right after we post a new available golden on our website’s AVAILABLE DOGS page. No need to keep checking our site for new dog postings – you’ll be sent an email notice as soon as it happens! Scroll down to the bottom of our regular Newsletter that you received by email. You’ll be taken to a profile page on our website. On that page look for YOUR LISTS. Newly Listed Dogs and then click on Save. That’s it! Next time there is a new posting in our Available Dog section, you’ll be sent a New Listing Alert!